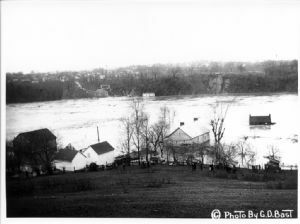 Largest of all floods in the Potomac Valley to date, the 1936 flood damaged the lockhouses and locks along the canal. The lockhouse at Lock No. 38, with the brown roof appearing here in the river, was located between the canal and the river. Unrau reported that this lockhouse was partially destroyed when a heavy drift knocked in its northwest corner. See: Unrau, H. D., & Gray, K. M. (2007). Historic resource study: Chesapeake & Ohio Canal. Hagerstown, Md: U.S. Dept. of Interior, National Park Service, Chesapeake & Ohio Canal National Historical Park.